Last week as I was on my Bird Snapping rounds on Blackberry hill, I came across a bird which I thought looked rather new to me. The sun was in my eye and I could`nt really make out what it was. 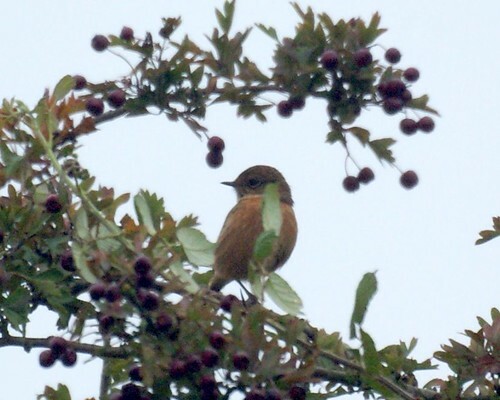 The next day again, I saw not one but upto 4 of these birds in the area and I confirmed my suspicions that these were stonechats. 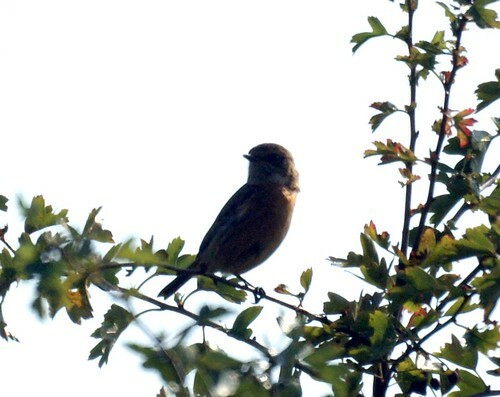 The Stonechat is generally considered to be an Old World flycatcher, family Muscicapidae. They, with similar small species in the family, are often called chats. 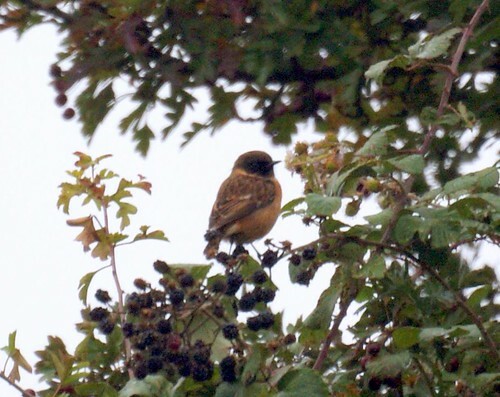 Although Stonechats are primarily insectivorous, they also feed on berries and seeds, especially in winter. 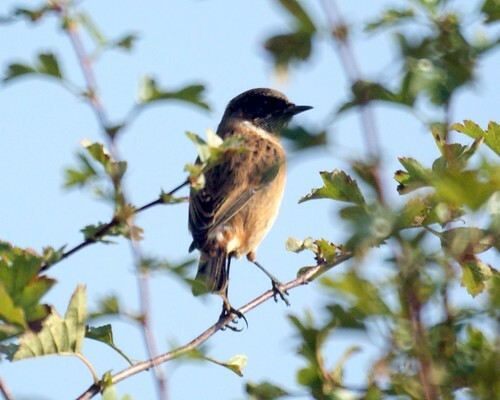 The male stonechat in summer has black upperparts, a black head, an orange throat and breast, and a white belly and vent. It also has white patches on the sides of its neck, a small white scapular patch on the wings, and a very small white patch on the rump often streaked with black. The female has paler brown upperparts and head, and no white neck patches, rump or belly, these areas being streaked dark brown on paler brown, the only white being the scapular patch on the wings and even this often being buffy-white. 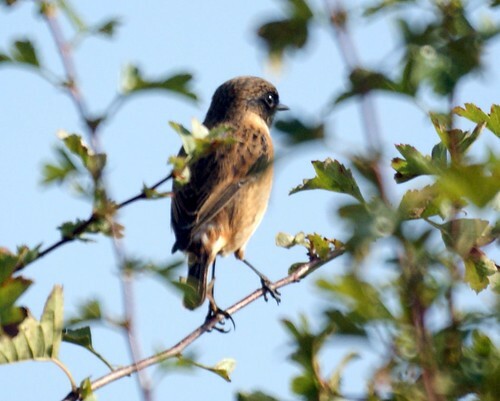 Stonechats breed in western and southern parts of the UK, but disperse more widely in winter. Some of them move to eastern coastal areas in the winter, while others fly south to the Mediterranean. The British winter population also includes birds from north-western continental Europe, e.g. Germany, where they are not doing too well. 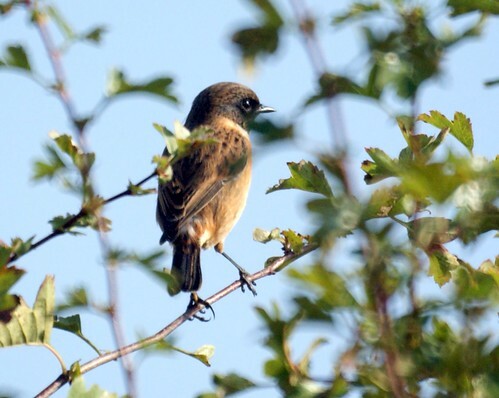 Stonechats are on the amber list of species on the conservation status. A very interesting post and series of photos.